Halloween, Thanksgiving and Christmas are all long past, yet I still have two big cans of pureed pumpkin in my pantry. I'm not surprised. I do the same thing every October. Upon spying the end aisle display of canned pumpkin, molasses and brown sugar, I become giddy. With visions of festive holiday pumpkin pie, pillowy soft pumpkin spice cookies and maple spiked pumpkin bread pudding clouding my judgement, I put at least six, sometimes eight, cans in my carriage. Then I'm happy. That is, until February rolls around. Pumpkin pie in February is just wrong. Pumpkin cookies are decidely autumn treats best paired with mulled apple cider. Pumpkin bread pudding wears out its welcome by December. So what's a girl to do with all that remaining canned pumpkin? Make muffins. For some reason, pumpkin muffins taste right anytime from October to March. Just don't eat them in April. It's unseemly. This is an adaptation of my mom's pumpkin muffin recipe. I used pecans instead of walnuts and added chocolate because, well, because it's chocolate. Oh, and Jeff asked me to mention that these muffins are even better with a generous smear of peanut butter or Nutella. 1. Position a rack in the middle of the oven and preheat to 350 degrees F. Coat a muffin tin with cooking spray. 2. In a large bowl combine oil, sugar, eggs, molasses and pumpkin. Stir well. In a separate medium bowl, combine flour, baking powder, baking soda, salt and pumpkin pie spice. Add slowly to the oil mixture, stirring well until flour is thoroughly dissolved. Gently stir in pecans and chocolate chips. Pour batter into the prepared muffin tin. 3. Bake for 18-20 minutes, or until the tops are lightly browned and a cake tester inserted into the middle of a muffin comes out clean. Transfer to a wire rack to cool for 5 minutes before removing. I like pumpkin chocolate mixture. I find this original. thank you for your recipe, I will try. Susan, I can't bear to look at this post first thing at breakfast. It looks so choco-licious, it's killing me! Oh, all right, will go try it with Nutella, or chocolate...if you insist! Seriously, can't wait to try this one....thanks for sharing! Yummy! I always have far too much pumpkin left over that just sort of stare at me from the cupboard. Can't wait to toss that mock back in their little pumpkin faces with this muffin recipe. Thanks for sharing! YUM! I love pumpkin bread and muffins! Adding the chocolate and pecans sounds delicious! You can't go wrong with pumpkin, chocolate and pecans. Wow what a trio for muffins. These muffins sound delicious! There's something about pecans and chocolate and pumpkin that go so well together. I do love pumpkin and it especially with nuts thrown in for good measure. I wish I had leftover canned pumpkin. I can't get it anywhere over here and I would love to try it. The muffins look amazing. I bet the flavour is immense. How did you know I have some leftover pumpkin sitting in my fridge (from making pumpkin pecan spice scones, YUM!) wanted to do something different with it, think I will be making some of these!! This sounds like a great idea to get rid of those pesky pumpkin cans that seem to find no place in my kitchen this time of year! Thanks for posting! I love the idea of chocolate with pumpkin! 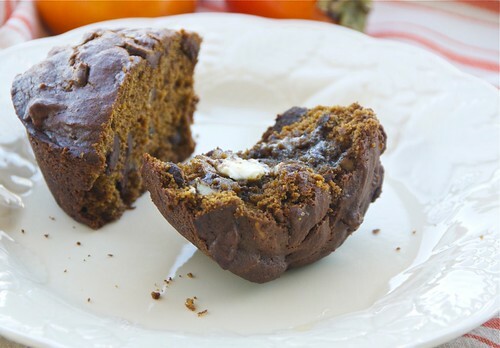 I just posted a pumpkin muffin recipe, too -- cream-cheese stuffed. Learned about it from blogging! Not exactly diet fare but definitely delish! Now I don't have enough pumpkin to make these. But they're on the list! I NEVER have leftover pumpkin. I eat a bowl of it every morning for breakfast, straight-up, and often a bowl for dessert with a crumbled GF graham cracker! Obsessed much? hahaha! I think we are shoppers separated at birth. I exhibit exactly the same behavior in the supermarket, and I too, have those extra cans of pumpkin in the pantry right now! Muffins it is, then. And, I think Jeff's advice is very wise. Yes I have a ton of leftover pumpkin in my pantry! Just noticed it the other day, so thanks for this recipe. I was just talking about how pumpkin isn't just for October and November, and it works so well in baked goods anyway. These muffins look like a great use it! Love the thought of peanut butter on them too. feeonmenale-I'm so glad you like it! teachercooks-It's a trio I love for sure! joanne-Pizza dough? Now, there's one I haven't tried. I'm intrigued. val-I'm for any excuse to add nuts! jacqueline-Really? Is it sold just seasonally then? liz-Glad I gave you the tasty reminder. gidget-Out of the can? Really? That I can't do. But I do love it in smoothies for breakfast. alyce-Oh, good. I'm glad to help! lisa-You have no idea how good they with pb! I am so making these, pumpkin is healthy so no guilt! I don't care for pb but oddly that sounds really perfect on these. I've never even made a muffin! Worth a try though, surely, especially with pumpkin. They look so deliciously chocolatey! I'd love to have one of those in front of me right now. healthy mama-You roast your own? That's savvy! Then you never have to worry about running out. scott-Really? They're the easiest thing to bake!